Dietary, microbial, and inflammatory factors modulate the gut-brain information highway, ranging from metabolism to cognition. 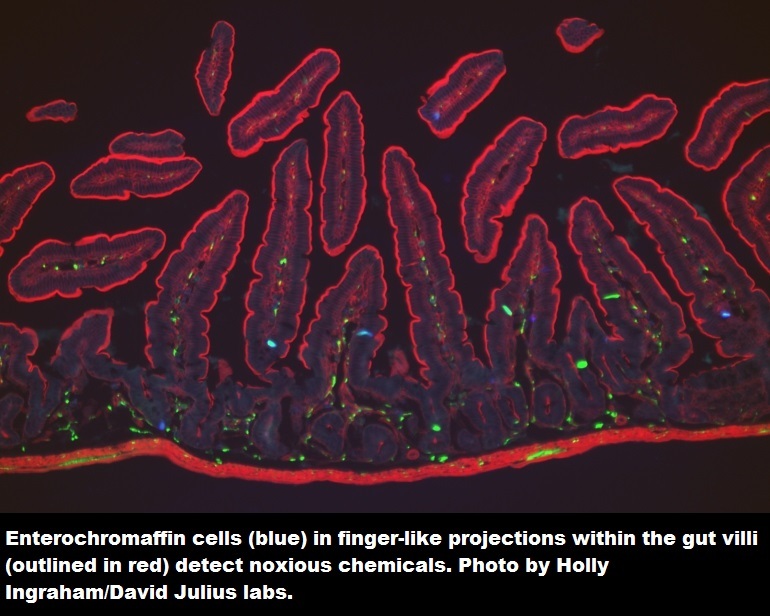 The gut epithelium is a principal site for detecting such agents, however, precisely how it communicates with neural elements is poorly understood. Now, a study from researchers at UC San Francisco identifies specialized cells, known as enterochromaffin (EC) cells, in the gut which sense potentially noxious chemicals and trigger electrical impulses in nearby nerve fibers. The team state that understanding the role of EC cells in how the gut reacts to chemical irritants could provide new approaches for treating gastrointestinal disorders such as irritable bowel syndrome (IBS). Previous studies show that, with over 100 times the surface area of the human skin organ, the gut is the body’s largest surface exposed to external substances. Though EC cells make up only 1% of the gut’s lining, they produce 90% of the body’s serotonin, a key signaling molecule. EC cells are interspersed among other cells that make up the lining of the intestinal tract, on the surface of tiny, fingerlike structures called villi that project into the gut’s inside space. Within the villi, underneath the EC cells and other cells, are nerve fibers which sense the movement and contents of the gut and contribute to intestinal pain and discomfort. However, precisely how these nerve fibers communicate with EC cells has been unclear. The current study utilises gut-mimicking organoids grown from mouse stem cells to show how EC cells in the intestinal lining alert the nervous system to signs of trouble in the gut. The current study shows that EC cells express specific chemosensory receptors, which are electrically excitable, and modulate serotonin-sensitive primary afferent nerve fibers via synaptic connections, enabling them to detect and transduce information from the gut directly to the nervous system. Results show that EC cells integrate information about chemical irritants, bacterial compounds, and stress hormones in the gut, then use serotonin to pass that information on to the neighbouring nerve cells, from which electrical impulses may travel throughout the gut’s nervous system and ultimately to the brain. The lab tested the EC cells’ reactions to dozens of different molecules and found that three classes of molecules caused a change in voltage across the cell’s membranes. Data findings show that the three types of molecules which triggered EC cells, namely volatile fatty acids, a class of hormones called catecholamines, and a dietary irritant called AITC have all previously been linked to IBS. Results show that when the EC cells are excited by any of these molecules, they release serotonin into synapses with the nearby nerve fibers, triggering electrical impulses in nerve fibers, indicating the signal can move quickly throughout the gut. The team surmise their study gives the global medical community a rigorous handle on exactly how the gut talks to the nervous system via cells behaving like neuronal colonies. For the future, the researchers state they now plan to study EC cells in organoids grown from human cells.